Zippity Doo Dah contains a lot of flying geese units, so the more you can make at once, the more time you save. Jenny shares an easy method for making four flying geese units at one time. She also shows how to chain piece them for even more efficiency. Then, once the geese are made, Jenny shows a couple of different ways you could lay out a number of flying geese units if you want to personalize your quilt. 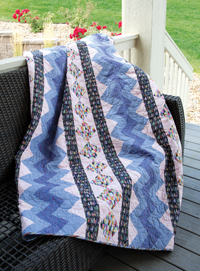 She also discusses the difference between light, medium, and dark fabrics and shares ways to lay them out using a variation of the Zippity Doo Dah pattern. Look in our online store to find all the items you need to create the project featured in this series!